Sometimes the best trips just seem to materialize out of nowhere. We'd had long-standing plans to hook up with our good friend Danni when she flew down for a short vacation trip to St. Augustine. When we saw how good the weather was supposed to be on Friday and Saturday, we made a more or less last-minute decision to ride up there instead of driving. 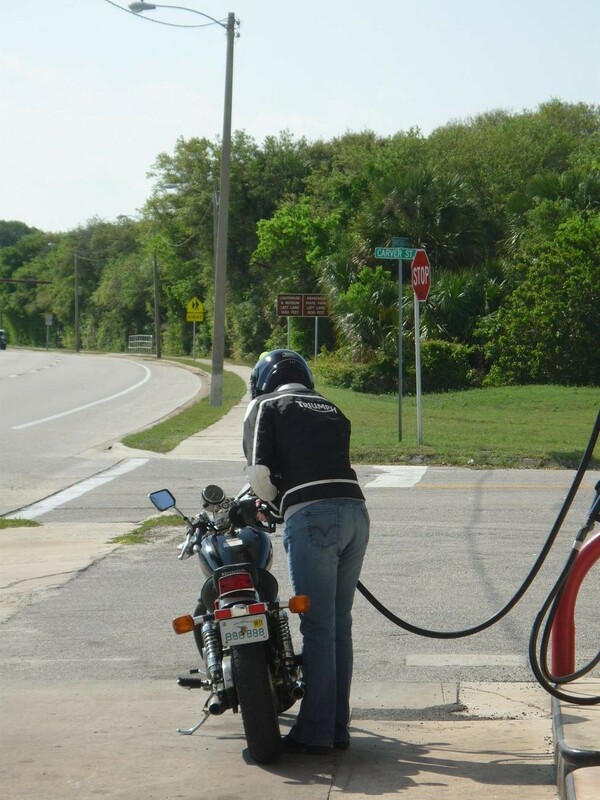 This turned into a slew of firsts for Trish -- including her longest ride so far by a wide margin (nearly 200 miles there and back) as well as her first overnight motorcycle road trip. She's quickly turning into a hell of a rider. We got a (relatively, for us) early start, leaving Geneva westbound on SR 46 at around 9 A.M. From Sanford we took SR 415 northbound, crossing the St. Johns river on the Osteen Bridge and continuing up into the Spruce Creek area, surveying the sweeping curves and rural scenery along the way. Traffic was light and the conditions were perfect -- clear, sunny, dry and cool. It was my favorite kind of ride: the kind that gives you a chance to see and enjoy the real Florida -- the lakes and forests, the goat farms, the fields of celery and strawberries, the orange groves, the pastures filled with cattle, the horse ranches, the old oak trees covered with Spanish moss, the small towns, the roadside diners, the country racetracks, the houses built in the 40s, the occasional phosphate mine or limestone quarry. It's a wonderful reminder of the pre-Disney era. We followed CR 421 eastbound all the way on out to the coast, vaulting over the beautiful Intracoastal Waterway on a long, high, steep bridge and finally hitting the T-intersection with A1A in Daytona Beach. (It's a particularly dramatic junction: you come over the top of the bridge and find yourself facing the great, wide, rolling blue Atlantic directly in front of you.) From there, we turned left and headed north. 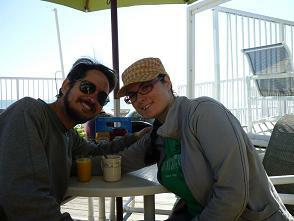 We paused in Ormond Beach at an oceanside restaurant called the Beach Bucket for a late breakfast. Trish got coffee and pancakes, I got orange juice and a tomato-Swiss-onion omelet with home fries and sourdough toast and as usual we shared everything. What a brilliant morning! The timing and location of this stop couldn't have been more ideal. 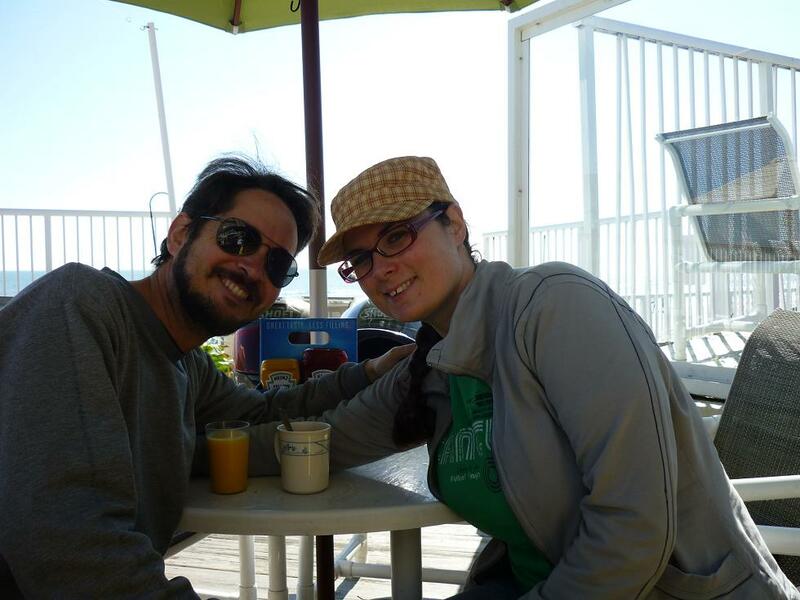 Enjoying a late breakfast at the Beach Bucket in Ormond Beach. With our bellies full and our spirits high, we resumed our trek northward. It's funny how seaside communities are similar all over the world. You've always got the one main two-lane highway with the beach itself right there on one side (plus the usual ramps, boardwalks and sandy parking lots) and immediately on the other side, facing the water, rows of quaint, cozy, often eccentric cottages. You always have a few whimsically decorated with pirate or general nautical themes, you always have a scattering of extravagantly elaborate private mansions and you always have plenty of houses painted in the international standard beach colors: coral, periwinkle, seafoam, aqua, lime, driftwood-gray, conch-pink and cloud-white. At one point we found ourselves sandwiched between the Intracoastal Waterway on the left and the Atlantic Ocean on the right. A sloop of about 35-40 feet was motoring northbound parallel to us. I'm assuming it was a retired couple. The wife was at the helm and the husband was up on the bow, hanging onto a shroud while he talked on his cell phone. They glanced at us briefly as we passed. I wondered if they were as curious about our journey as we were about theirs. We made it into St. Augustine shortly after noon. Trish prepares to pull into the hotel parking lot. We met Danni and had a splendid afternoon. We hung out on the beach together for a little while, caught up on news and puzzled over some jellyfish that had inexplicably washed up in large numbers on the sand. Then she gave us a condensed but entertaining tour of the historic city, we bought a generous assortment of candy from the Whetstone Chocolate Factory and we had a mostly delicious (but strange) dinner at a Spanish restaurant where the food was pretty good but the staff and management are evidently from another planet. Danni and her daughter had tickets to go on a ghost tour, so Trish and I took a long, romantic walk past the Castillo de San Marcos, along the waterfront and into the Old Town Square. We wandered past various craft shops and art galleries and finally found ourselves upstairs at a quiet little wine bar with an open balcony that faced a tree-filled courtyard in the Spanish Quarter. I ordered an Argentinian Malbec, Trish tried a bartender-recommended red (a Rioja) and we sat there talking of ships and shoes and sealing-wax, of cabbages and kings as live music poured softly from the room around the corner. It was a lovely, delightful evening. 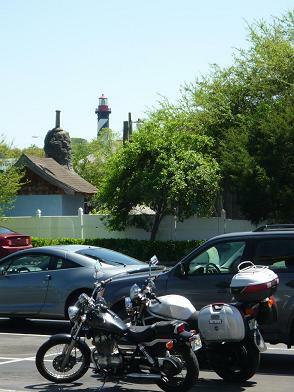 Our bikes parked at the hotel with the St. Augustine Lighthouse visible in the background. Trish and I sacked out hard and slept in until ten. : ) We were remarkably (and unexpectedly) efficient about getting up, getting out the door and getting on the road -- much to my surprise, we were pulling out of the hotel parking lot by 10:35. We pondered this point later; we came to the conclusion that it was easier to leave a hotel than it was to leave home simply because you have fewer decisions to make. You can dither and fidget for hours trying to get out the door when you have your entire array of worldly possessions to sift through and pack -- when you're leaving a hotel room, you bundle everything together, stuff in it your luggage and off you go. Just before we started our engines, we were approached in the parking lot by an old man who asked us where we were from and where we were going. After Trish told him, he proclaimed that he had always felt that "four wheels were safer than two." This, of course, is the Standard Reaction that I was writing about in my previous blog. Sometimes it's polite disapproval, sometimes it's a harsh condemnation, but it's always an admonition. It makes me want to go up to those same people while they're eating in a public restaurant and say, "excuse me, but all that high fat, high sugar, high sodium and high cholesterol greatly increases your risk of heart attack, stroke, type II diabetes and certain types of cancer." Trish defused the situation with her usual aplomb, however, pointing out to him that between the two of us we did, in fact, have a total of four wheels . . . thus there was nothing to worry about. And with that, she shut her visor and we roared off. Refueling along a quiet section of A1A. We stopped at another oceanside restaurant, the Java Joint, for food and coffee. The Java Joint has an upper deck that provides an excellent, unimpeded view of an unspoiled stretch of grassy dunes, shell-strewn sands and breaking surf. After filling up on a bagel and a veggie burger, we went down the sun-bleached, weather-worn wooden steps and rested for a few minutes before getting back on the road again. 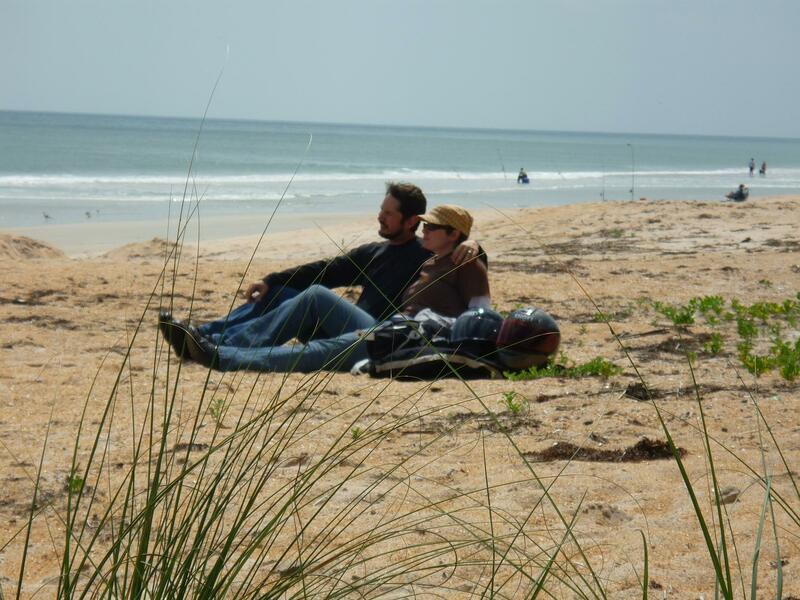 Taking a short beach break in the Flagler area. 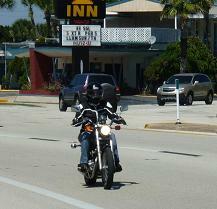 Soon we were once again southbound along A1A. 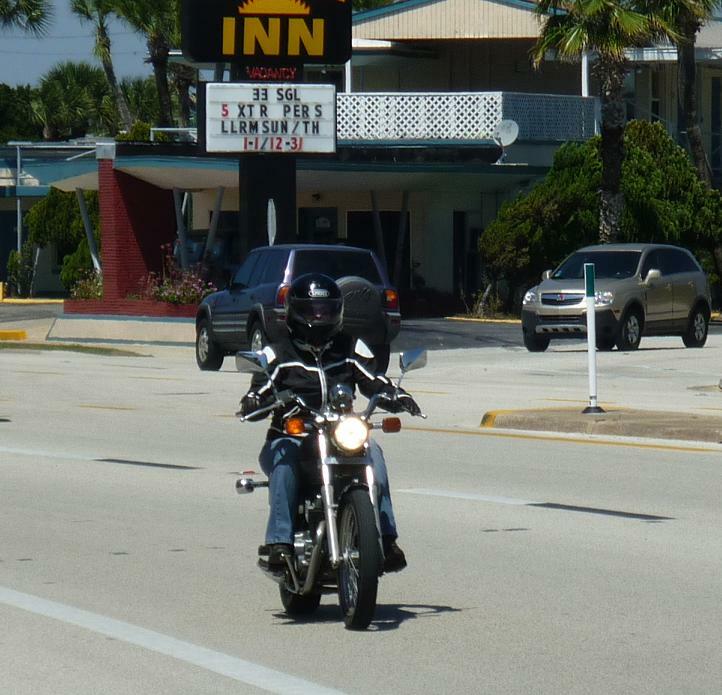 Now that the weekend had begun, the highway was thick with other riders out enjoying the fine spring day. We weaved through some congestion surrounding a local craft fair and stopped for cold drinks at a dollar store. A woman came up to Trish and complimented her on her bike, saying that she wanted to get one just like it for her daughter. By now it had warmed up so much that Trish switched to her mesh jacket. (Thanks, Karen!) The rest of the ride back to Geneva was as scenic and pleasant as the ride out had been. It was definitely our best ride together yet. Trish has progressed rapidly into a damn good motorcyclist and is already tackling excursions that riders with twice her experience would consider ambitious. Danni described her as "fearless" and "a rock star." I tend to agree with those characterizations.